Trusted by police for over 20 years, the Earphone Connection (EPC) emerged as a driving force in the two-way radio accessory industry. Getting their start in the Santa Clarita Valley, EPC introduced the first wireless microphone with push-to-talk, the first quick release cables and many other ground-breaking products to redefine the status quo. Two-way radios are relied upon in a vast number of industries, many that reside here in the Santa Clarita Valley. 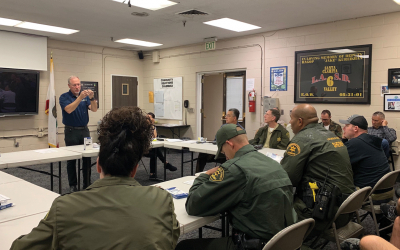 On November 29 EPC had the privilege of spending the early morning roll call with our local Santa Clarita Sheriff’s Dept., where we donated 50 Micro Sound tubeless listen only earpieces. It was a great opportunity to promote officer safety in our own community and demonstrate all the benefits of going tubeless! It was humbling to have the attention of so many officers that do so much to keep our city safe. It would not have been possible without Deputy Lapkin, who helped to put it all together. We sincerely thank her and all of the officers who participated in the training/giveaway. It’s easy to understand why all types of businesses would employ two-way radios in the workplace. Two-way radios are mobile, reliable and instant, allowing people to talk to each other immediately across distances at the press of a button. However, the functionality of a handheld radio has its limits. Accessories make all the difference when it comes to professionalism, comfort and all-day use. Lack of proper accessories can actively discourage radio use, undermining your investment. EPC has a wide range of radio accessories that can provide unprecedented comfort, hands-free capability, and offer discrete communications when security or privacy is important. The Earphone Connection invites two-way radio businesses in the SCV to visit their showroom. Their knowledgeable staff can provide you with a one-on-one consultation and deliver a solution that can meet your specific needs. Whether you work in an office, hotel or are a retail professional, if you use two-way radios, EPC has the accessories that your business needs to improve safety and efficiency. Visit The Earphone Connection Monday – Friday, 8 a.m. to 4 p.m. at 25139 Avenue Stanford in the Valencia industrial center. Come by for demos, a free sample of our innovative Fin Ultra Ambi ear tip or you can call 661-775-5665 to make an appointment for EPC to come to your business. You can also learn more about our product line at www.earphoneconnect.com.